The Kia Sportage facelift recently arrived in the country with a starting price tag of RM 126,888. Also, at the 2018 KLIMS, Kia put on display the 2.0D GT-Line Sportage model. The car offers a distinctive package which really makes it stand out of the crowd. The overall design of the Kia Sportage, the flagship 5-seater SUV from the Korean company, is somewhere between boxy and curvy, which is one unique design attempt. The recent facelift saw the introduction of many features in and out, including a modern touch screen infotainment unit and revised front fascia with the new front bumper. In Malaysia, the Kia Sportage is available with both petrol and diesel engine options. The 2.0-litre MPI petrol engine belts out 155 PS of maximum power output and 192 Nm of peak torque. Meanwhile, the 2.0-litre diesel engine churns out 185 PS of maximum power output and 400 Nm of peak torque. Both these engines are mated to an 8-speed automatic gearbox. Sportage is available in 5 different colors - Iron Grey, Fiery Red, Mercury Blue, Snow White Pearl and Cherry Black. The Kia Sportage was born in 1993 as a unique and quirky looking crossover to set itself apart from the crowd. However, over the years, it has emerged itself as a mature looking and well-built crossover which certainly justifies its premium positioning. 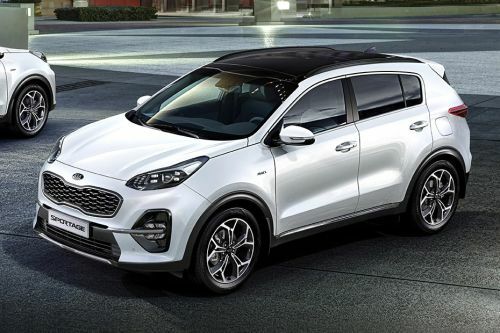 The Kia Sportage has received a slight makeover for 2019 in terms of additional features, and is now available with two engine options – one petrol and one diesel. On the inside, things now seem to work in the favor of the Kia Sportage. The cabin has now been refreshed with the inclusion of many new age features. Out goes the flat bottom steering, and comes, a more rounded, conventionally styled wheel with silver garnish on its lower portion. The subtle looking instrument console now has a smaller MID screen than before, which still is informative and manages to look premium. The centre console now features a large 7-inch touchscreen infotainment system with reverse camera, Android Auto and Apple Carplay. Below this infotainment system, the centre console continues to get the large mix-up of several buttons for climate control and push-button besides it for bringing the engine to life. The Kia Sportage has always been one unique looking crossover. While it looks premium and big enough making it imposing on the roads, the quirky design language might not go well with everyone in the crowd. In this latest iteration, the Kia Sportage does get a number of minute changes which have managed to make it look modern. The front profile of the Sportage continues to get blessed with the same trademark “Tiger-nose grille” with chrome surrounds and headlamps positioned at the upper corners of the grille. However, the headlamps are now full LED units with daytime running LEDs within them. The front bumper too has been redesigned with fresher looking fog lamps with chrome garnish, and the inclusion of skid plates at the lower centre. The Kia Sportage retains the sleek looking side profile with no major changes, except for the new alloy wheels design, which surely looks much snazzier than before. At the rear, the Sportage has got large LED tail lamps, which are connected to each other with a nice looking LED strip and a chrome bar above it as well. The Kia Sportage continues to sit on the same monocoque frame as before, and thanks to the presence of ground clearance and large 19-inch alloy wheels, the Sportage feels solid and pliant on all kinds of surfaces. The overall suspension, given its SUV credentials, has been tuned on a stiffer side to give the Sportage a fun-to-ride character. For the Malaysian market, the Kia Sportage now comes with a choice of two engine options. Talking about the petrol powered first, the 2.0-litre MPI engine produces 155 PS of power and 192 Nm of torque. On the other hand, the 2.0-litre diesel engine churns out 185 PS of power and 400 Nm of torque. Both these engines are coupled to a common 8-speed automatic gearbox. Being a premium midsize crossover, the Kia Sportage is quite loaded with all the modern safety features, which do include front, side, and curtain airbags, ABS with EBD, reverse parking sensors, hill hold assist, hill launch assist, engine immobilizer, parking assist system, and auto cruise control. The Kia Sportage has always been one quirky yet premium looking vehicle, and in this minor facelifted version, Kia has managed to address all the problems in one go. While the quirky design language is still a love-it-or-hate-it affair, the crossover now is equipped with all the modern features which were erstwhile missing. On the other hand, the excellence of the Sportage in other parameters such as performance, ride comfort and handling continue to remain intact. With this premium packaging, the Kia Sportage is compelling enough to give the similarly priced conventional SUVs a run for their money. What are the Safety Features Available in Kia Sportage?